As a Florida family, we love having people over for outdoor get togethers . This is especially true in the summer when the temperatures are hot, hot hot and we don’t want to warm up the house by using the oven. So, this means that our BBQ gets a lot of use as does our pool. However, it also means that with our super busy schedules, I don’t have a lot of time to plan fancy meals or desserts. Most of the time we’re throwing hamburgers and hot dogs on the grill, cutting up some cold watermelon and then we always have S’mores party fixins’ in our cupboard, because for us any day can be a S’mores day! Since it does get SO warm here in Florida during the summer, I was looking for a way to make our favorite S’mores into a cool treat. Plus, it’s always fun to change things up a bit. This was the inspiration for my 10 Minute S’mores Ice Cream Sandwich cake. This S’mores recipe really is super quick and crazy easy and yet earned a HUGE WOW and YUM from guests at one of our recent summer parties. The 10 minutes is split into two five minute prep times. 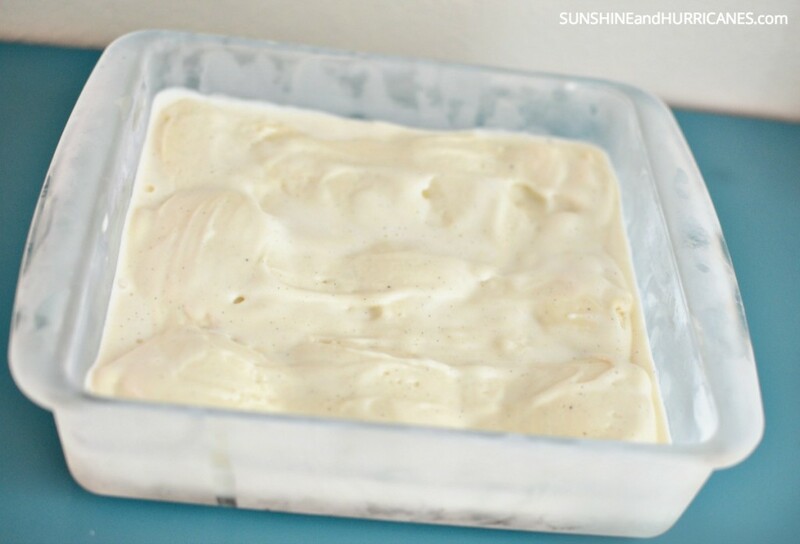 Early in the day or even the day before you are expecting guests, you want to set out your favorite brand of vanilla ice cream and let it soften up a bit. 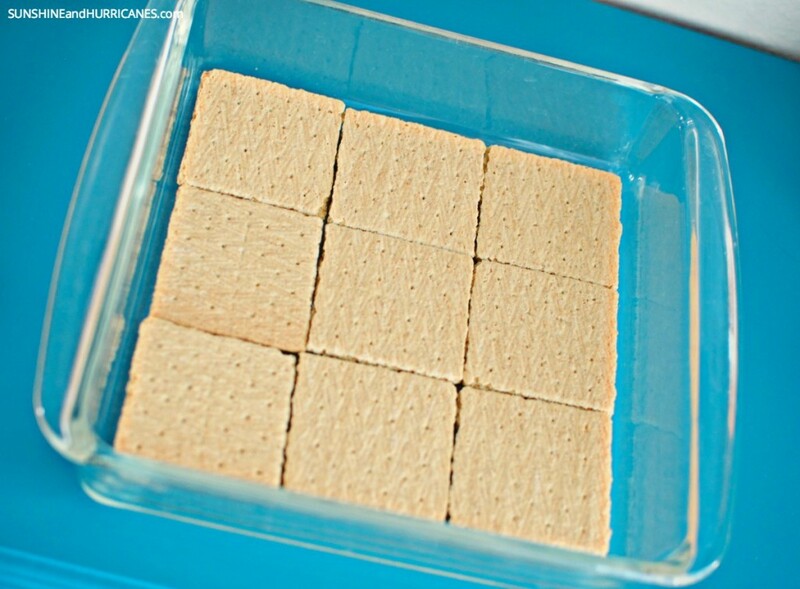 Next, grab a square baking dish and cover the bottom with 9 graham cracker squares. Once you’ve got your graham crackers covering the bottom of the baking dish, put one scoop of the softened vanilla ice cream on each square. To spread it out, I actually used the palm of my hand and just applied gentle pressure to smush it down and then I used a spatula to spread it out and distribute the ice cream. Then pop it back into the freezer so it gets nice and solid again. (This is really important, because you want the ice cream to be really frozen when you get ready for the next step). Alright, so it’s almost time to serve dessert. 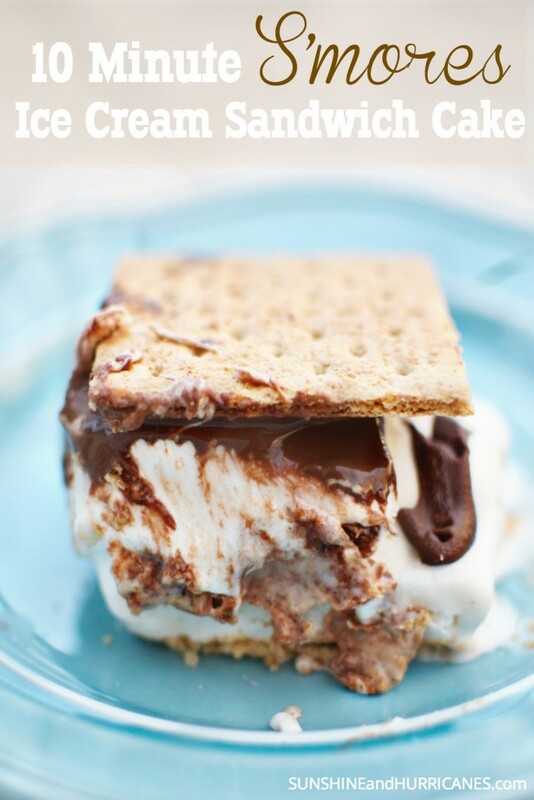 Now, you’re ready for the second 5 minute prep in your 10 Minute S’mores Ice Cream Sandwich Cake recipe. 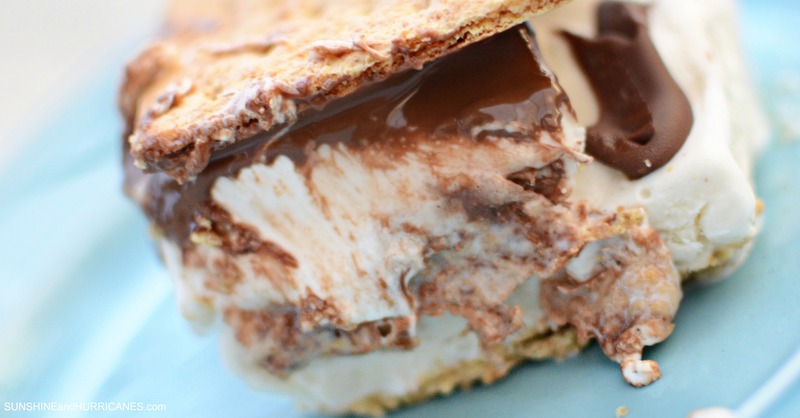 Fire back up the grill if it isn’t already on, because for this S’mores recipe you don’t need a campfire. Then line a baking tray with aluminum foil and place nine graham squares on it with a little space between each one. 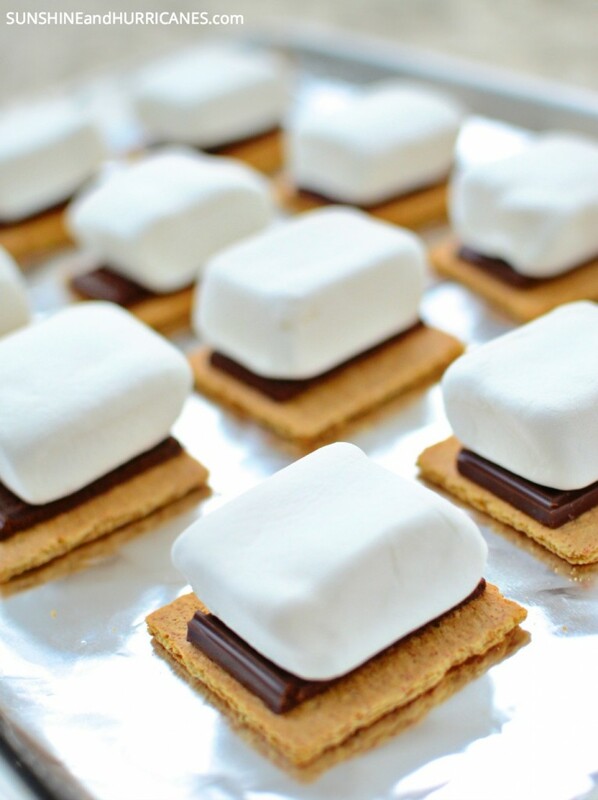 Place 3 sections of the chocolate on each graham cracker square and top with a square marshmallow. 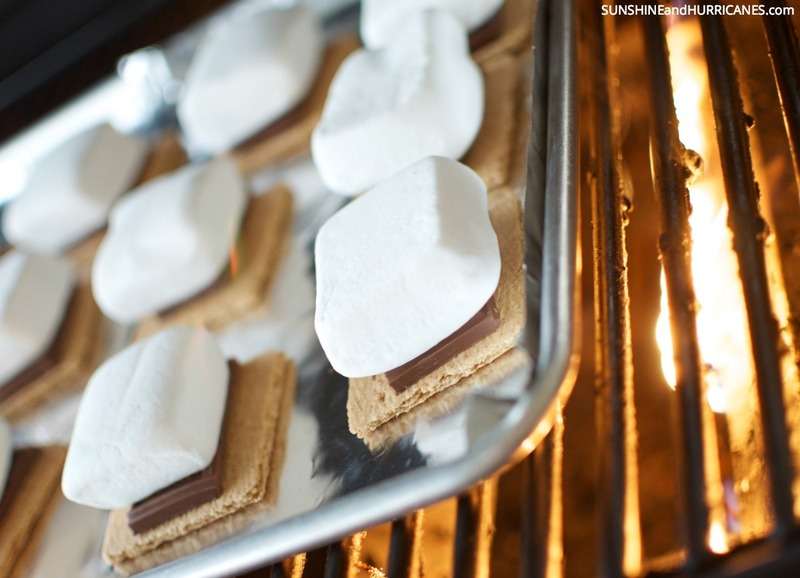 The tray can go directly on the grill and you’ll want to leave the squares on to cook about 3 minutes, just until the chocolate starts to get a little melty and you see the marshmallows starting to expand. Finally, you’ll need a spatula and the ice cream portion of the dessert that is waiting in the freezer. 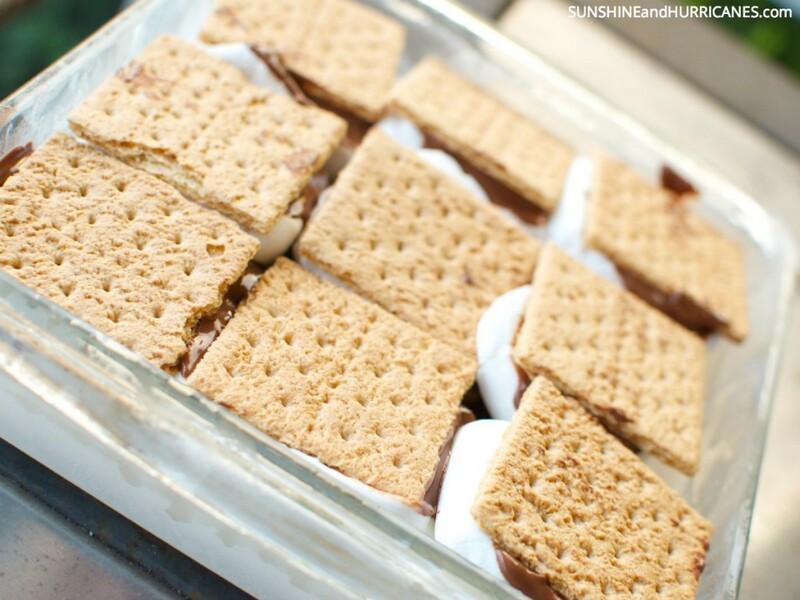 Pull the tray off the grill and using the spatula, flip the chocolate and marshmallow squares one by one to top the ice cream in the baking dish. 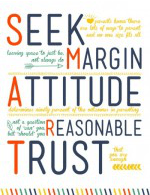 It will get a little oozy and messy, which is just what you want. Once you’ve covered the whole dish, quickly use the spatula to scoop out a serving for each guest. If you re-froze the ice cream it will stay solid even though you’ve added the warmed chocolate and marshmallows, but it’s still best to serve right away. However, as a little side note, I had some leftovers and so I just stuck the whole dish back in the freezer and the next day I was able to cut the remaining pieces out and serve them as individual ice cream sandwiches to my kiddos. It wasn’t all ooey gooey and good the way the original cake turned out, but still delicious! 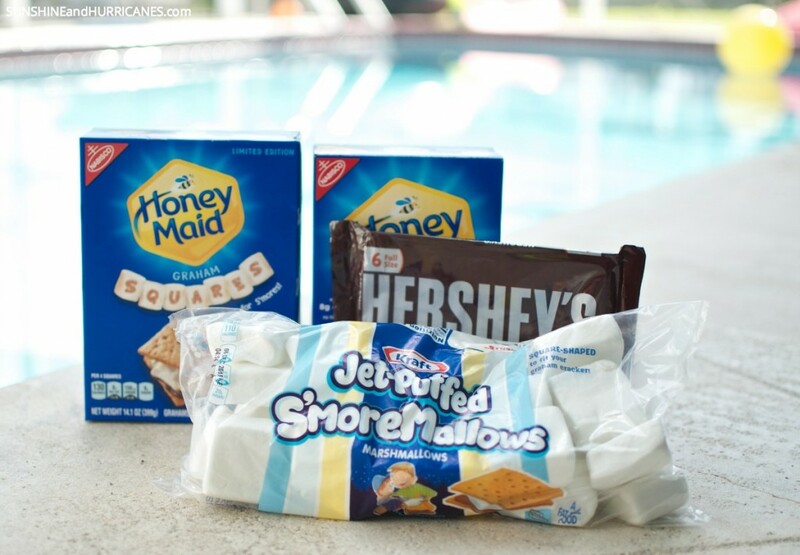 How does your family make and enjoy S’mores for Summer Party fun? This looks amazing Your photos are gorgeous too!!! Thanks so much! I’ve been working on my photography. It’s so much fun!